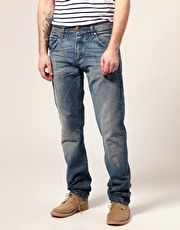 Produktbeskrivning för Wrangler Ben One Year Tapered Jeans: Straight cut jeans by Wrangler, featuring a mid-coloured wash with One Year ageing, a button fastening to the waist, logo tab to the back and five pockets. Last jeans from the Worn Across America story. ABOUT WRANGLER WORN ACROSS AMERICA Iconic American label Wrangler have utilised innovative production techniques to produce a range of denim that tell the story of a pair of jeans Worn Across America. Using their world famous Ben jeans, the collection starts at zero days with classic indigo and then adds the distresses and worn details that naturally occur over the lifecycle of a pair of jeans. Each pair takes on signature signs of wear and tear, depending on how long they have been worn for.